It’s the most wonderful time of the year at The Entertainment Capital of L.A. as Universal Studios Hollywood and Universal CityWalk deck the halls for a wintry calendar of festive holiday experiences and an array of delectable treats that families and friends far and wide can enjoy. The all-new “Christmas in The Wizarding World of Harry Potter” experience will resonate throughout the immersive land this yuletide season transforming the iconic HogwartsTM castle into a dazzling light projection spectacular, while the quaint town of Hogsmeade village shines brightly with décor uniquely themed to each of the individual storefronts. The a cappella Frog Choir, comprised of Hogwarts students and their giant throaty frogs, will perform all-new holiday themed songs. A wide selection of all-new custom-made Christmas ornaments created especially for “The Wizarding World of Harry Potter” will also debut this season. Collectibles include a variety of decorative Hogwarts castle snow globes, Hogwarts crest and mascot ornaments representing each of the houses, as well as a collection of unique tree toppers and house pennant garland. Newly introduced holiday-themed fare and the eagerly-awaited seasonal return of hot Butterbeer will further complement the overall experience. “Christmas in The Wizarding World of Harry Potter” will take place daily from November 24, 2017 through January 7, 2018. The all-new “Christmas in The Wizarding World of Harry Potter” experienceinvites guests to celebrate this special time of year in J.K. Rowling’s compelling Wizarding World for themselves. 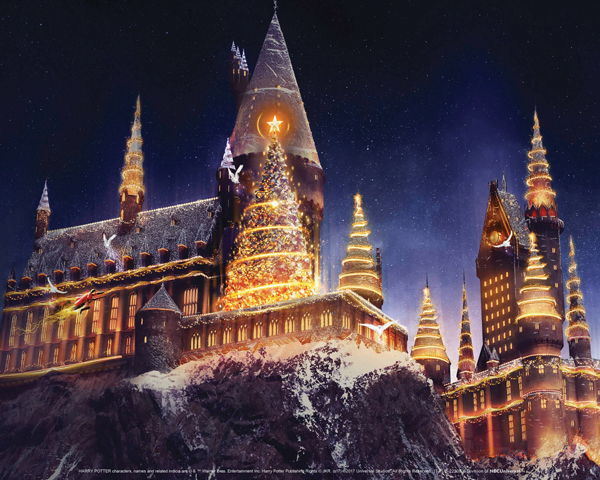 As night falls on Hogsmeade village, “The Magic of Christmas at Hogwarts Castle” will illuminate Hogwarts™ School of Witchcraft and Wizardry with colorful imagery and impressive dimensional animations that dance across Hogwarts castle in tandem to a musical arrangement from the Harry Potter movies. “Grinchmas™” returns to Universal Studios Hollywood with a Who-lebration of fun fit forThe Grinch, his faithful dog Max and a roster of Who-ville Whos. The annual event comes to life with a towering 60 foot tall whimsical “Grinchmas” tree where Martha May Who-vier and the Who Dolls will take center stage performing energetic musical sets to usher in the Christmas season in style. The Who-liday Singers—a hip boy-band ensemble—will perform nightly a cappella concerts featuring a mix of Christmas favorites and pop rock. “Grinchmas” will take place weekends on December 2-3 and 9-10, and daily from December 15 through December 31. Santa Claus will make nightly appearances and offer special photo opportunities at 5 Towers. The iconic, dancing water fountain situated at the heart of CityWalk will also make a splash this holiday season. This visually dynamic fountain, displaying over 230 individual power jets, will project streams of choreographed water into the aircomplemented by red and green LED lights and an array of holiday-themed music. The spirit of the season continues with a wintertime transformation of Universal CityWalk, beginning the day after Thanksgiving on November 24 through December 23,2017. The holidays at Universal Studios Hollywood is included in the price of theme park admission. A similar holiday program will also take place at Universal Orlando Resort. Theodor “Seuss” Geisel is quite simply the most beloved children’s book author of all time. Winner of the Pulitzer Prize in 1984, an Academy Award, three Emmy Awards, three Grammy Awards, and three Caldecott Honors, Geisel wrote and illustrated 45 books for children. Hundreds of millions of copies have found their way into homes and hearts around the world. While Theodor Geisel died on September 24, 1991, Dr. Seuss lives on, inspiring generations of children of all ages to explore the joys of reading. About Universal Studios Hollywood is The Entertainment Capital of L.A. and includes a full-day, movie-based theme park and Studio Tour. As a leading global entertainment destination, Universal Studios Hollywood delivers highly themed immersive lands that translate to real-life interpretations of iconic movie and television shows. Recent additions include “The Wizarding World of Harry Potter ™” which features a bustling Hogsmeade village and such critically-acclaimed rides as “Harry Potter and the Forbidden Journey” and “Flight of the Hippogriff™,” Universal Studios Hollywood’s first outdoor rollercoaster. Other immersive lands include “Despicable Me Minion Mayhem” and “Super Silly Fun Land” as well as “Springfield,” hometown of America’s favorite TV family, located adjacent to the award-winning “The Simpsons RideTM” and the “The Walking Dead” daytime attraction. The world-renowned Studio Tour is Universal Studios Hollywood’s signature attraction, inviting guests behind-the-scenes of the world’s biggest and busiest movie and television studio where they can also experience such authentic and immersive thrill rides as “Fast & Furious—Supercharged.” The adjacent Universal CityWalk entertainment, shopping and dining complex also includes the all-new multi-million dollar, redesigned Universal CityWalk Cinema, featuring deluxe recliner seating in screening room quality theatres, and the “5 Towers” state-of-the-art outdoor concert stage.